Species Description: Bingham RE, Papenfuss TJ, Lindstrand III L, Wake DB 2018 Phylogeography and species boundaries in the Hydromantes shastae complex, with description of two new species (Amphibia: Caudata: Plethodontidae). Bulletin of the Museum of Comparative Zoology, 161: 403-427. This is a cryptic species that is very similar in external morphology to its two close relatives Hydromantes shastae and H. wintu. The species share the general features of the genus in being of moderate size (maximum standard length of H. samweli is less than 70 mm) and having a short (less than 32 mm), strongly tapered, blunt-tipped tail. The head is broad and relatively flat. The maxillary teeth of the males are elongate and oriented on the bone so as to protrude from the side of the mouth. The limbs are relatively long and overlap by as much as one costal interspace when adpressed to the sides of the body. The trunk has a blocky appearance because of the elongate, muscle enwrapped epibranchials that lie under the skin of the back. The digits are relatively long and stout and are webbed at their base, leading to the vernacular name applied to the genus, web-toed salamanders. The relative finger lengths are 1 < 4 < 2 < 3 and the relative toe lengths 1 < 5 = 2 < 4 < 3 (Bingham et al. 2018). Because of an authors’ error the list of measurements of the holotype of H. samweli are a repeat of those of the holotype of H. wintu (Bingham et al. 2018). The correct measurements, in millimeters, are presented here (MVZ 170650, an adult female):—Head width 9.2; snout to gular fold (head length) 13.7; head depth at posterior angle of jaw 4.7; eyelid width 2.1; eyelid length 3.4; orbitonarial 2.5; eye to snout 3.4; horizontal orbit diameter 2.8; intercanthal 2.2; interorbital distance 2.8; distance between nuchal groove and gular fold 4.5; snout to forelimb 17.0; internarial 2.7; snout projection beyond mandible 0.9; snout to posterior angle of vent (standard length) 57.0; snout to anterior angle of vent 52.4; axilla to groin 28.8; chest width 7.7; number of costal interspaces between appressed limbs −0.5; tail length 28.2; tail width at base 3.2; tail depth at base 3.4; forelimb length (to tip of longest finger) 15.4; hind limb length 17.2; hand width 4.0; foot width 6.0; length of fifth toe 0.8; length of third toe 1.6. Numbers of teeth: premaxillary + maxillary 57; vomerine 30. Hydromantes samweli differ from H. shastae and H. wintu in measurements analyzed used multivariate morphometrics but otherwise they can be separated only by allozymic and DNA sequence differences. This species differs from H. shastae in having a shorter digit 3 on the foot (Bingham et al. 2018). In life, these salamanders have a generally gray to gray-brown coloration with yellowish or reddish highlights, and the gray color has a metallic sheen. The lower surfaces are a flat gray color. In preservative, the specimens are range from various shades of cinnamon and medium fawn to grey (Bingham et al. 2018). 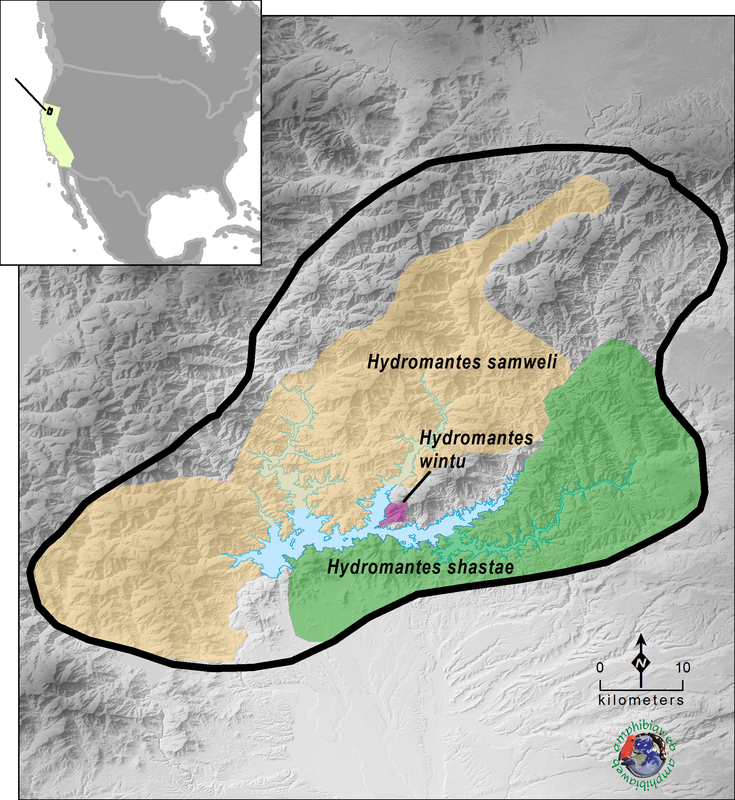 The species is endemic to limestone dominated local habitats in drainages between Squaw Creek and the McCloud and Sacramento Rivers, and to the west of the Sacramento River in the Backbone Ridge and Mammoth Butte regions, north of the Shasta Reservoir in Shasta County, northern California. This species has the northern-most distribution of the shastae complex. The vegetation in the region is a mosaic of hardwood, conifer, and hardwood-conifer forest with chaparral inclusions. Winters are cool and wet, and surface activity occurs during this time; salamanders can be found under rocks and other surface cover. Summers are long periods (5 to 7 months) of hot, very dry weather, and underground retreats are essential. Caves and limestone fissures are extensively used. The species is distributed discontinuously, in generally small patches of habitat, and the total range is very small. The total dimensions of the range of the shastae complex total about 850 km2, of which 119 km2 is occupied by Shasta Reservoir. 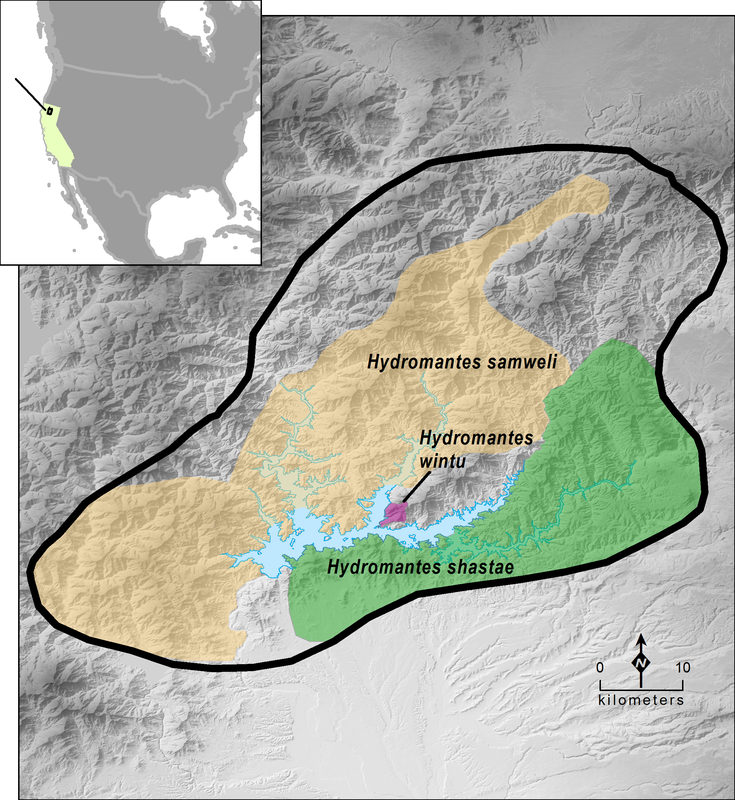 To illustrate the distributions of the H. shastae group, the map shows Hydromantes shastae in green, H. samweli in orange, and H. wintu in pink (after Bingham et al 2018); the previous range map for H. shastae is outlined in black. Unconfirmed localities exists in the southwest and north of the previous range. Members of the shastae species complex are excellent climbers and use their webbed toes to climb on sheer, slippery rock surfaces (Gorman and Camp 1953). Eggs have been found in moist caves during the summer (Gorman 1956). The species is locally common on the surface during moist periods in fall, winter and spring seasons. The construction of Shasta Dam mid-20th century submerged low-lying populations of this species and plans to raise the level of the dam pose a significant threat for some surviving populations; most populations occur at elevations far above lake level and should be safe. Current lake level is 328 m and populations presumed to be assignable to H. samweli are known to occur as high as 1661 m (Lindstrand III et al. 2012) at the northwestern extremity of the range. The species authority is: Bingham, R. E., Papenfuss, T. J., Lindstrand III, L., Wake, D. B. (2018). “Phylogeography and species boundaries in the Hydromantes shastae complex, with description of two new species (Amphibia: Caudata: Plethodontidae).” Bulletin of the Museum of Comparative Zoology 161: 403-427. The species epithet, “samweli”, is after Samwel Cave, where the species was originally found. The name of the cave, a well-known fossil site, is derived from “Sa-Wal”, which means “Grizzly Bear” in the language of the Winnemen Wintu Tribe, the original inhabitants of the area (Bingham et al. 2018). Bingham, R. E., Papenfuss, T. J., Lindstrand III, L., Wake, D. B. (2018). ''Phylogeography and species boundaries in the Hydromantes shastae complex, with description of two new species (Amphibia: Caudata: Plethodontidae).'' Bulletin of the Museum of Comparative Zoology, 161(10), 403-427. Gorman, J. (1956). ''Reproduction in plethodontid salamanders of the genus Hydromantes.'' Herpetologica, 12, 249-259. Gorman, J. and Camp, C. L. (1953). ''A new cave species of salamander of the genus Hydromantes from California, with notes on habits and habitats.'' Copeia, 1953, 39-43. Lindstrand III, L., Bainbridge, K., Youngblood G. (2018). ''Habitat characteristics, a range extension, and an elevation record for Shasta salamanders.'' California Fish and Game, 98, 236-241. Species Account Citation: AmphibiaWeb 2018 Hydromantes samweli: Samwel Shasta Salamander <http://amphibiaweb.org/species/8811> University of California, Berkeley, CA, USA. Accessed Apr 24, 2019.